David I will be leading up another version of the popular Developer Direct Summer School eLearning series starting next Monday. This is a series of quick 30 minute lessons on Android and iOS app development with RAD Studio, Delphi and C++Builder. Whether you're just looking into mobile development or looking for more advanced architecture and connectivity ideas, there is something in this series for everyone. Join the Developer Direct team in this free, fun and interactive 6-lesson online course complete with learning resources to help along the way. 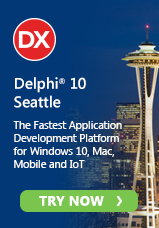 Learn the required foundation skills to create applications targeting Android and iOS using RAD Studio, C++Builder or Delphi XE6. And Gain an understanding of the differences between mobile and desktop development. Register for this eLearning series to attend live, watch sessions on demand and get access to the learning materials. Don't miss out! Get a free RAD Studio XE6 30-day license to follow along with the sessions and work with the sample code.